Eco-silk especially for hand knitting with two colors combination. The yarn contains plenty of air so the touch is so gentle. 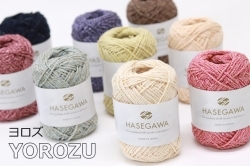 You can use this yarn widely such as wear and accessories. Lovely form with a cute coin purse. There is no preparation of knitting chart. Please note.